Swim only when lifeguards are on duty; never underestimate the ocean or overestimate your ability to swim in the ocean. Swim within the designated areas only. Parents should never leave their child unattended. Obey all rules and posted signs. Always listen to lifeguards; it is their job to protect you. Stay hydrated by drinking plenty of water, especially on days with excessive and oppressive heat. Protect your skin – wear sunblock with a minimum sun protection factor of 15 anytime you expect to be exposed to the sun. Reapply as often as you need it. Wear eye protection. UV rays can damage eyes. Wear sunglasses that absorb at least 90 percent of UV sunlight. Watch for signs of heat stroke. These include red, hot and dry skin, lethargy, nausea and vomiting, and weakness and dizziness. If you suspect someone is suffering from heat stroke, get the victim to a shady or cool area and call for assistance. Wear protection on your feet. Sand and pavement can get extremely hot in the summer sun and can burn feet. 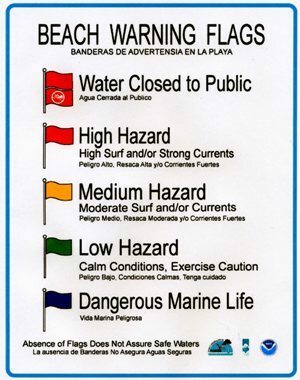 A rip current is a narrow, powerful current of water that runs perpendicular to the beach. Rip currents pull swimmers away from the beach every year. Over 100 people in the United States lose their lives because of them. Drowning deaths occur when people try to swim against the current. The accompanying chart illustrates how to get out of a rip current if you ﬁnd yourself in one. Do not ﬁght the current; swim parallel to the shore. Purple: Flown with either Red or Yellow: Dangerous marine life, but not sharks. Take your cell phone to the beach. In case of an emergency, where the lifeguard is not present, call 911.